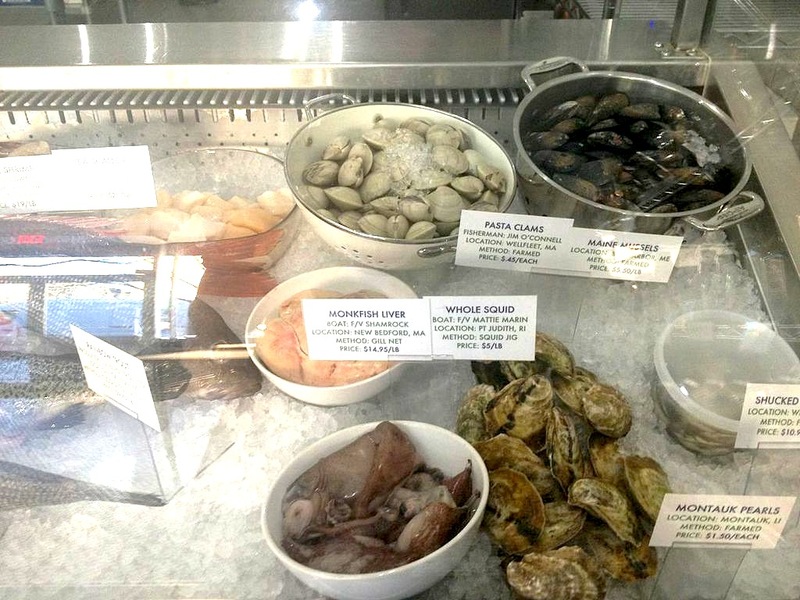 All summer and fall of 2013, the Local Pickins crew eagerly looked on as a little Brooklyn, NY-based CSF called ‘Mermaid’s Garden’ waged an impressive Kickstarter campaign, with the goal of raising enough funds to open up their very own brick and mortar location. We were rooting for them not just because Brooklyn is in dire need of more high-quality fishmongers – we knew also that they were bound to do interesting and creative things with any space they got their hands, such as host cooking classes and delicious local fish dinners. 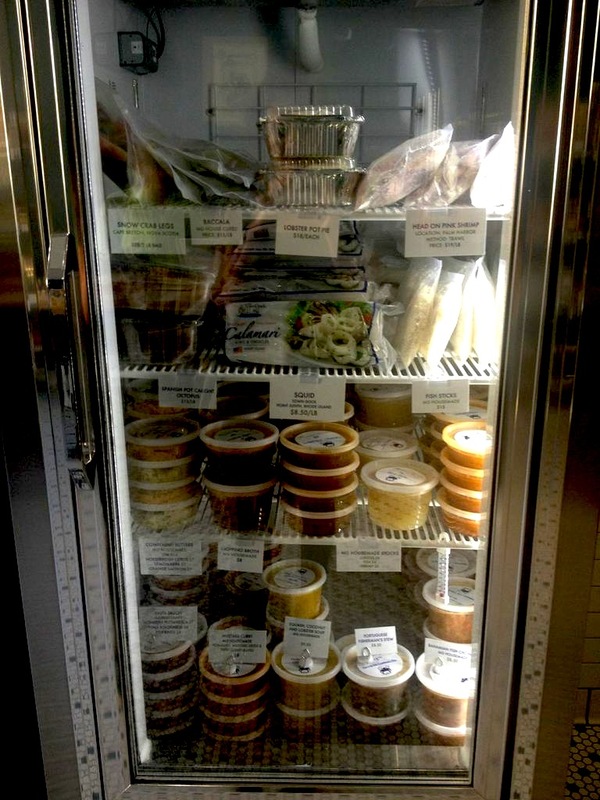 So, needless to say, we were quite excited when their campaign was a success, and we couldn’t wait to pay a visit to the Mermaid’s Garden Market in Brooklyn’s lovely Prospect Heights neighborhood. We found our excuse to do so on April 9th, 2014, when, after finding out that Mermaid’s Garden had just begun to offer cooking classes (check their website for a current schedule of upcoming classes), we signed up to attend a ‘Basic Fish Cookery’ class at the Market. The Market itself is nothing short of beautiful: a big, airy, open space with shelves, refrigerators, and display cases full of beautiful, fresh fish, fish-y condiments, appetizing fish accompaniments, and various made-in-house prepared goods. We made a mental note to stop back in before our next dinner party – this would be the perfect place to pick up the fixings for a shrimp party platter, clams for the grill, or a whole fish for a main course. 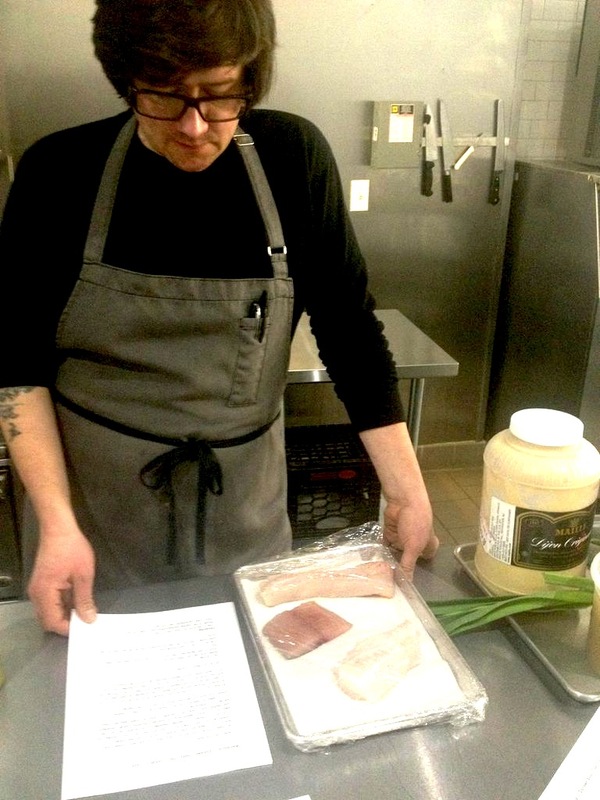 The class itself was a calm and intimate affair, led by one of the co-founders of Mermaid’s Garden, a former restaurant chef. We began by getting some simple tips on the care and keeping of the fresh, raw fish you buy from a fishmonger. If you’re not going to use the fish right away, they suggest storing it in a ziplock bag filled with a “slurry” of ice and water. Most fish will keep this way for 5 to 7 days, and you can always check with your fishmonger when you purchase a fish about the particular storage time for that type. We were also cautioned to always clean ungutted fish you might acquire as soon as possible, and definitely before storing it. Next, we prepared a simple Salsa Verde, quick to make and the perfect accompaniment to many fish dishes. The salsa was delicious and pungent, with a little kick from red chile flakes and an added anchovy. 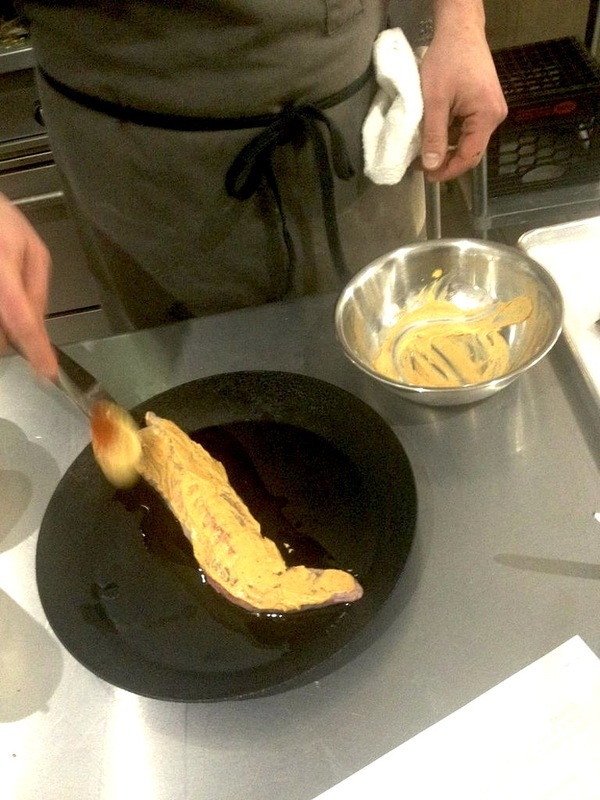 Our first fish subject was a fillet of Monkfish, which we coated in a spicy mustard mixture, and cooked on the oven in a heavy, pyrex pan over super high heat. 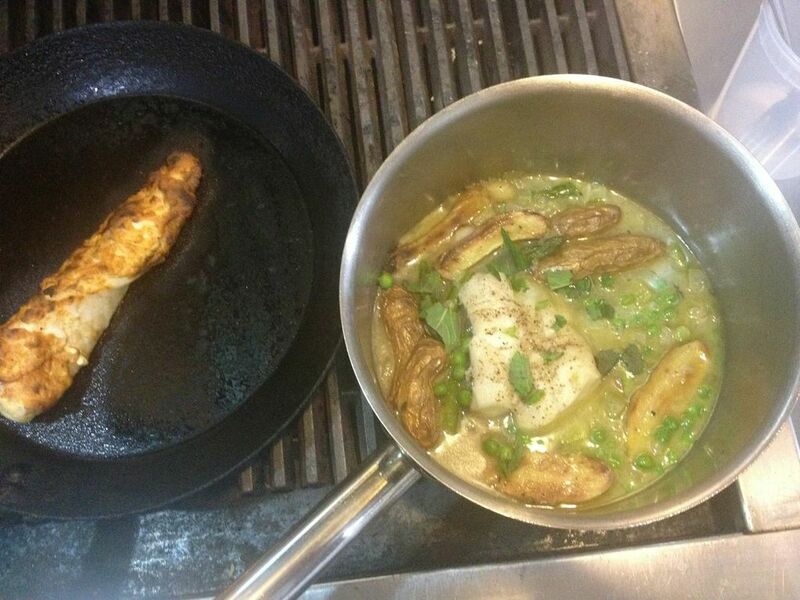 Monkfish is a hearty, thick fish, forgiving and perfect for roasting, and it smelled amazing as it cooked. 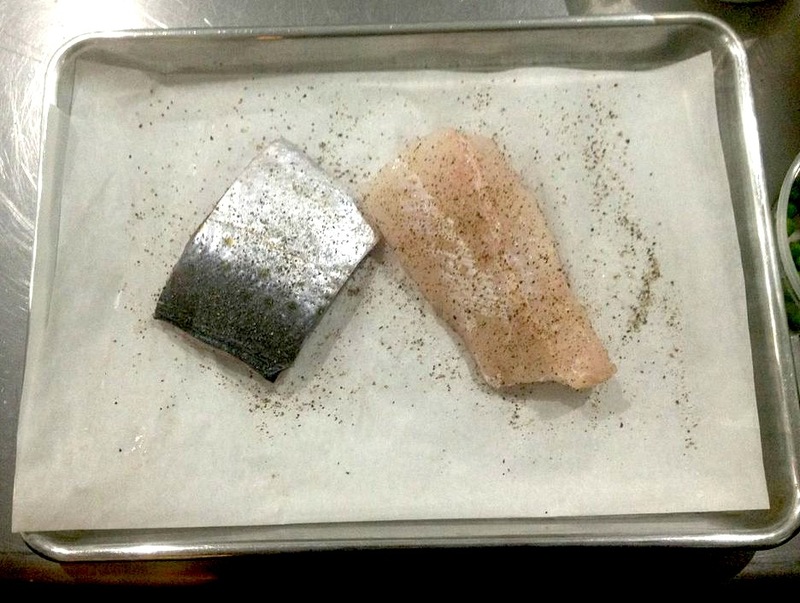 The next two fish we would be working with, Spanish Mackerel and Hake, we seasoned first, sprinkling them with salt and pepper, a flavor necessity when you’re not using a mustard crust or the like. The Mackerel fillets, skin left on, we patted down super dry, and threw into a hot pan with grapeseed oil, a good frying oil because its smoke point is much higher than olive oil’s. Right at the end of cooking, we also added a healthy pat of butter, which we spooned over the fillet as it bubbled and browned. This adds amazing flavor and crustiness to the outside of the fish, and gets the skin super crispy. The most colorful and springlike dish was the braise, essentially a complete meal in one pan: Hake, fresh, local green garlic, asparagus, potatoes, peas, and fish stock, as well as Mermaid’s Garden’s own fennell, celery, and onion mir poix, which went into the pan first. Then went in the stock, and the rest of the ingredients we added one by one, in order how long they would take to cook. The fish itself, covered about halfway with stock, cooked to perfection in about eight minutes. Such an easy and straight-forward cooking experience, peppered with helpful tips from the Mermaid’s Garden staff. We couldn’t wait to try the fruits of our labor, and the dishes did not disappoint. Our favorite was also the simplest to cook – the Pan Fried Mackerel was amazing, the outer crust perfectly browned and cruncy, and the inside tender, almost melty soft. The braise was fresh tasting and delicious, a wonderful one-pot way to prepare fish and seasonal vegetables – although the vegetables we used in ours were all spring treats, you can use any other mix of seasonal edibles during other times of year. The roasted Monkfish was the most unusual, a great dish for lovers of spicy mustard, and fish with thickness and bite. We loved the post-class dinner set up that Mermaid’s Garden set up for us, complete with crab placemats and cold glasses of white wine! The perfect ending to a wonderful, and highly recommended, cooking experience. Previous Post High on the Hog … Butchery Class! Next Post Marveling at the options for Mother’s Day!